Death-defying leaps for the competitors, high thrills and raclette for the spectators: the Xtreme Verbier, climax of the Freeride World Tour, is a spectacle unlike any other. First, find yourself a sunny, sheltered viewpoint. Next, whack on some sun screen. Then pull out your binoculars, and peer through them at the cliffs opposite – and pray that the skier hurtling over them doesn’t smash his body to pieces on the rocks below. 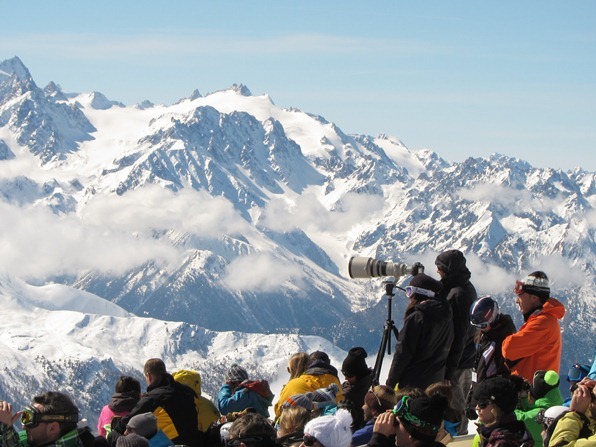 The Xtreme Verbier has to be one of the more bizarre events on the international skiing and snowboarding circuit. Thousands of spectators gather on a col high above the Swiss ski resort of Verbier to watch the world’s top freeriders risk their lives on a mountain that was once considered unskiable. Helicopters circle above carrying camera crews. Every trick and jump is beamed live in high-definition detail onto a giant screen – along with every mistake and fall. The chance of an accident, lasting injury or death is very real. You can’t help feeling queasy watching: is this the ski world’s equivalent of watching blood sports, or rubbernecking at a car crash? 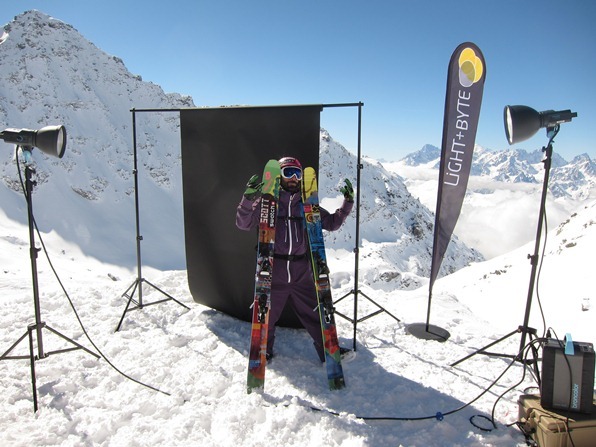 During the Xtreme Verbier, the climax of the Freeride World Tour, the Swiss resort takes on a party atmosphere. Stalls line the main street selling items such as avalanche airbags, probes, shovels, transceivers and anything else that the thought of a sudden, nasty death in the mountains might inspire you to buy. If you fancy your chances as a future competitor, scale the giant scaffold at the end of the street, ride down a snowy chute and pirouette onto a giant airbag – and judges will rate your tricks. 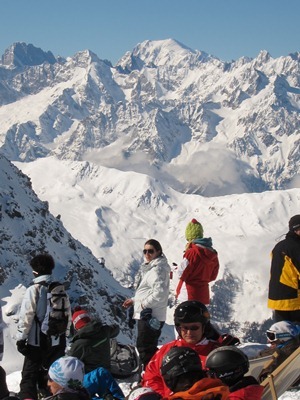 On the big day, competitors and spectators alike ride a sequence of gondolas and cable cars up to the Col des Gentianes at nearly 2,900 metres, and spectacular views of the Mont Blanc massif. High above looms the Mont-Fort, the highest point of Verbier’s ski area (3,303 m), venue for the FIS World Cup Final in speed skiing at the end of the season, and a fresh attempt to break the world record, which currently stands at just over 250 kph. Today’s death-defying antics, however, are confined to the 3,223-metre Bec des Rosses, which looms across the valley like a giant snow-dusted tombstone. You feel giddy just looking at it. The athletes have been up on the col on the preceding days, scrutinising the face of the Bec through binoculars, and picking out and memorising their lines down slopes festooned with cliffs and rock bands. Gradients range between 45 and 60 degrees – which means that as the athletes ride down, they won’t be able to see more than a few metres in front of them. During the wait for the athletes to hike the ridge to the top of the Bec, spectators have the luxury of contemplating violent death in comfort. This season there’s a new restaurant up on the Col, like a giant, high-tech eco-igloo, where you can buy hot drinks or mulled wine to soothe your nerves. Outside there are stalls where you can buy Freeride World Tour souvenirs, anything from an official avalanche airbag backpack (CHF 990) to FWT-branded underpants (CHF 10). Today they only have S and M sizes left, but the woman on the stall says they’re very stretchy – presumably to accommodate those giant cojones? Not far away, an emergency rescue helicopter is on hand, complete with medical team. Each of the competitors is equipped with helmet, back protection and backpack containing search and rescue equipment, but if you tumble down a cliff, you want help as soon as possible. As the start of the contest approaches, helicopters carrying film crews wheel through the sky above the Bec like impatient vultures. The women are to kick off the contest, from a lower starting point: first snowboarders, then skiers. The men will then ride from the summit, in the same order. Watching them through binoculars are a team of experts stationed on the col, who will judge each run for choice of line, fluidity, level of control, technique, and quality of tricks, jumps and landings. 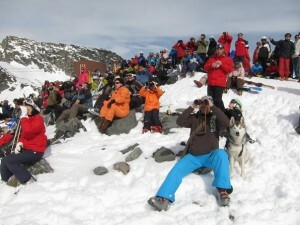 The spectators have the benefit of seeing close-ups on the giant screen – filmed both from the helicopters, and from cameras stationed at various points on the mountain. One by one they go down, mixing fast powder turns, technical sequences through the rocks, straight-lining couloirs, leaping off cliffs and pulling tricks along the way, before sweeping in long graceful curves across the open snowfields at the bottom of the face. Their grace seems effortless. The last group to come down, the men skiers, seem jinxed: one rider after another takes a tumble. Each time the crowd falls silent; when one of the skiers clips rocks at the foot of a jump with his skis and cartwheels across the snow, even the commentator sounds sick at the thought of the consequences. Miraculously, though, the rider gets up, and even skis part of the way down on one ski. This entry was posted in Freeriding. Bookmark the permalink.